Oxfordshire is home to an estimated 682,400 residents, including students and armed forces (ONS, mid year population estimate 2017). This latest estimate was an increase of +22,400 (+3.4%) compared with the population of the county 5 years ago (mid-2012). The number and age profile of people living in Oxfordshire, and how this population is likely to change over time, is key information for planning services such as schools, health care, and care for the elderly. The 2018 JSNA includes a chapter on population. For areas smaller than Local Authority, the ONS publishes estimates for wards and statistical geographies (Lower and Middle layer Super Output Areas). The ONS estimates that as of mid-2017 the population of Oxfordshire was 682,400. 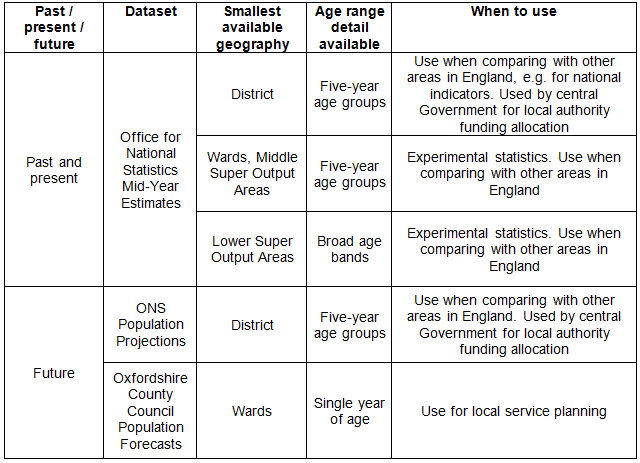 When to use this data: use for Oxfordshire’s county and district population estimates when comparisons will be made with other parts of the country, e.g. for reporting national indicators or applying for government grants. Use Ward estimates when comparing local areas in Oxfordshire with other local areas in England. However, for parishes and output areas, the best estimates are Census data. Oxfordshire County Council housing-led forecasts (revised April 2018) for districts. Downloadable excel workbooks provide rounded data for Oxfordshire and districts, persons, males, females from 2016 to 2037. Population figures for mid-2016 to mid-2041 for persons, males and females in five year age groups for local authorities in England. Estimating the number of people moving into and out of local authority areas is a key component of population estimates and projections. The Office for National Statistics publishes regular updates on national and local area migration , including experimental statistics on short term migration. Note that the survey methodology used for migration totals changed several times 2001-2011 and the 2011 Census revealed estimates of international migration were significant underestimates. Migration information from the 2011 Census was published by ONS in December 2012 and gives data on recent international migrants in England and Wales independent of the survey methodologies mentioned above. It includes analysis by country of birth and passports held, reported at national, regional and local levels. Our interactive dashboard shows you 2011 Census data how many people came to Oxfordshire from EU countries. You can also explore trends in the countries of origin of Oxfordshire's mothers with our interactive chart.